Egyptians clearly want their legal and political systems to be shaped by Islam. Most say laws should strictly adhere to the Quran, and a majority of Egyptians think religious leaders should have at least some influence in political matters. On the question of religious freedom, however, the public is divided over whether the government is doing enough to protect the rights of religious minorities, such as Coptic Christians. When asked how closely the legal code in their country should follow the teachings of the Quran, about six-in-ten Egyptians (58%) answer that the laws should strictly follow Islam’s holy book, while roughly three-in-ten (28%) say the laws should follow the values and principles of Islam but not adhere precisely to the Quran. Only 11% of Egyptians think their country’s laws should not be influenced by the teachings of the Quran. These attitudes closely mirror findings from previous surveys in 2011 and 2012, when roughly the same proportion of Egyptians (62% and 60%, respectively) stated that their laws should closely follow the teachings of the Quran. Over the same two-year period, the percentage of Egyptians who say laws should not strictly adhere to Islam’s holy book has increased slightly, from 5% to 11%. When asked about the role of religion in politics, nearly seven-in-ten Egyptians say religious leaders should have a large influence (27%) or some influence (42%) in political matters. 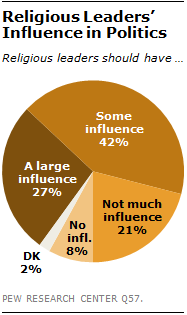 About one-in-five (21%) say religious leaders should not have very much influence in political affairs, while only 8% think religious figures should have no influence at all in politics. Support for religious leaders having at least some influence in political matters is stronger among Egyptians 50 years of age and older (76%) than among those under 30 years of age (66%). In addition, Egyptians who want their country’s laws to closely follow the teachings of the Quran are more in favor of religious leaders playing a role in politics (74%) than are Egyptians who either want their national laws to broadly reflect the values of Islam or not be influenced by the Quran at all (61%). Egyptians are divided about how much the current government is doing to protect of the religious freedom of non-Muslims in the country. Roughly four-in-ten (39%) say the present administration is doing too little to protect the rights of religious minorities, such as Coptic Christians, while a nearly identical proportion (38%) says the government is doing the right amount. Few Egyptians think the current regime is doing too much (13%) to ensure that religious minorities can freely practice their faith. Among Egyptians who want the country’s laws to closely follow the teachings of the Quran, the prevailing view is that the government is doing enough, rather than too little, to ensure religious freedom for groups like Coptic Christians (43% vs. 33%). By contrast, Egyptians who prefer less Quranic influence over their nation’s laws are more critical of the government’s efforts to protect religious minorities: roughly a third (32%) say it is doing enough, while nearly half (47%) think it is doing too little.